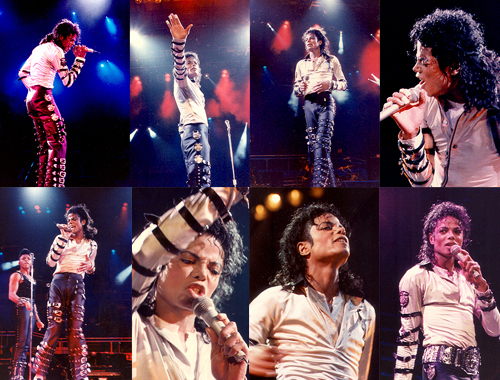 All Michael Jacksonitems listed below are authentic and very limited. We do not carry multiple items. All prices and availability are subject to change. All prices include shipping and handling for all USA customers. All other destinations will require actual shipping cost to complete transaction. Have a question? Ask us before purchasing the item. Thank You. 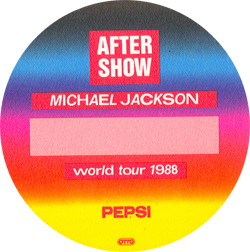 Description: 1988 Michael Jackson Bad World Tour Backstage After Show Pass. Official pass issued by Otto. Item intact in mint condition. Size 5" round. Description: 3x5 BW 1984 concert/ticket handbill. 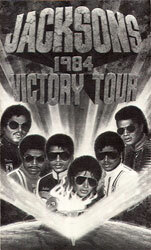 Original double sided handbill that came with mail ordered tickets for the 1984 Jacksons Victory tour. 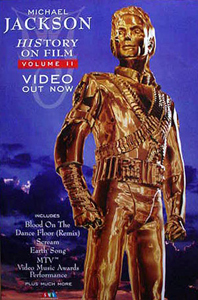 Description: Michael Jackson History On Film Promo movie Poster. Size 21x28. Item in mint condition. Description: Ticket Stub in VG- condition. Show two. Description: Ticket Stub in VG- condition. Show three. Surprise guest appearance by Eddie Van Halen.